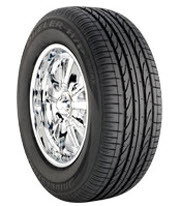 Bridgestone Dueler H/P Sport tires are used as original equipment on many of today’s performance sport utility vehicles and pickups, but are also available as replacement tires. The symmetrical tread design on the Dueler H/P Sport is highly engineered, with much of it taken from the Potenza RE050 performance tire. The tread design is composed of larger shoulder blocks, as well as intermediate blocks with center ribs around the circumference. The result is a tire that gives the driver better overall handling and added confidence behind the wheel. The LL Carbon and wider circumferential grooves increase wet weather driving performance, and greatly reduce any risk of hydroplaning. Inside the tire you’ll find twin steel belts that are strengthened by spirally wrapped nylon, to go with a polyester cord ply carcass. They work together to provide added strength and stability at higher speeds. It also helps extend the treadlife. Overall, the Bridgestone Dueler H/P Sport is a good high performance street or sport truck summer tire. It withstands aggressive cornering on dry pavement, while also providing solid traction on wet roads. The ride is comfortable for a tire in this class. Our only drawback is the lack of a mileage warranty. Prices on the Dueler H/P Sport range from around $210 for the 17 inch series to upwards of $283 for the largest 20 inch series tires. Get the best Bridgestone tire price with coupon below, or find other brands tire coupons and reviews at this link. Who Are Bridgestone Dueler H/P Sport Tires Designed For? Bridgestone has developed the Dueler H/P Sport for drivers of all types of SUV’s, Crossovers and performance pickups who want excellent handling and traction on both dry or wet roads, as well as a surprisingly comfortable ride. Bridgestone Tires does not provide for a mileage warranty on the Dueler H/P Sport. However, you will find a 1/32 inch of wear guarantee on tire uniformity. Materials and workmanship are covered for 5 years and includes free tire replacement during the first 3 years. A prorated amount is given for the remaining time period until there is less than 2/32 inch of useable tread depth left on the tire. You’ll also get Bridgestone’s 30-Day buy it and try it guarantee whereby you can refund or exchange the tires for a different Bridgestone model if you are not completely satisfied.